The procession of the crosses from ARC to St. John's Lutheran on Good Friday 2018. The ARC family gathers for worship at 10:30 a.m. on Sundays throughout most of the year. The worship service starts at 9:30 a.m. from the first week in July through Labor Day weekend. The service includes congregational singing, a time for sharing joys and concerns, a children’s message, Scripture readings, a choral anthem, and a pastoral sermon. The Sacrament of Communion is celebrated on the first Sunday of every month. Child care is provided in the church nursery during the service for children through age 3. "Sermon Sacks" with activities for older children are available in the sanctuary. Everyone is invited to join us for coffee and conversation in the Fellowship Hall following the worship service. Maundy Thursday Service of Tenebrae and Communion (April 18), 7:30 p.m. Most scholars believe that the word “Maundy” comes from the Latin word "mandatum" (“commandment”). In the context of Holy Week it refers to the commandment Jesus gave to his disciples while washing their feet, as recorded in the Gospel of John, chapter 13, verses 35 and 35: "A new command I give you: Love one another. As I have loved you, so you must love one another. By this everyone will know that you are my disciples, if you love one another." This service commemorates the Last Supper, when Jesus introduced the sacrament of Communion. We will celebrate that sacrament during the service. The word "tenebrae" means "darkness." During the service, candles representing the twelve disciples are extinguished one by one during the reading of the Biblical account of Jesus's betrayal abandonment by his disciples. The sanctuary slowly grows darker. Finally, the Christ candle is also extinguished as he is given over to crucifixion and death. The worshipers leave the dark sanctuary in silence as they ponder the impact of Christ's death and await the coming Resurrection. Good Friday Service (April 19), 1 p.m. The service remembers Christ's death on the cross, which occurred during the afternoon. 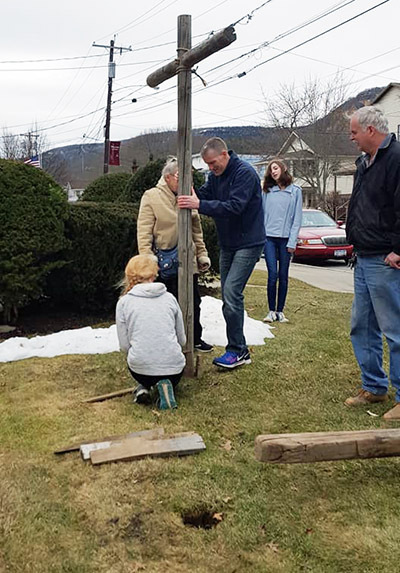 After an ecumenical service at ARC, worshippers will carry three wooden crosses north on Jay Street to St. John's Lutheran Church on Maple Avenue. The crosses will be placed in the ground to await Easter morning. Easter Sunrise Service (April 21), 6:30 a.m. The outdoor service is held at the Pleasant View Farm (Rau farm) at the intersection of Lainhart Road and Settles Hill Road in Altamont. The service is about 30 minutes long, so pleasee bring a chair if you want to sit. The Chancel Choir sings anthems and leads congregational singing from September through mid-June. New members are welcome: no prior experience required, although it helps to have the ability to read music. Rehearsals are on Thursday evenings from 7 to 8:30 p.m. and on Sunday mornings from 9:30 to 10:15 a.m. If you're interested in joining the choir, please contact the Church Office Administator (nancymacarc@gmail.com). A message will be placed on the church’s answering machine (518-861-8711). A sign will be posted on the church door next to the parking lot. A notice will be placed on the church Facebook page and website. Members of Consistory will make an effort to call the homes of individuals and families who typically worship on Sunday mornings.